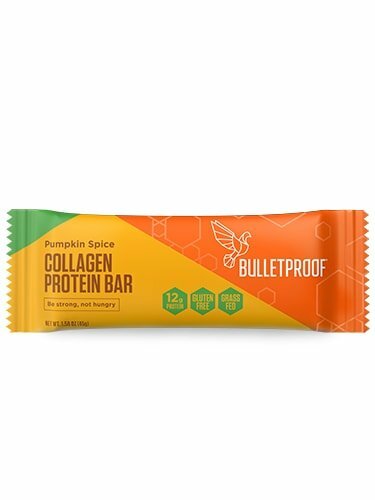 1 box of 12 Bulletproof Collagen Protein Bars Pumpkin Spice flavour. Limited edition. Crafted with Bulletproof® Upgraded Collagen and Brain Octane. 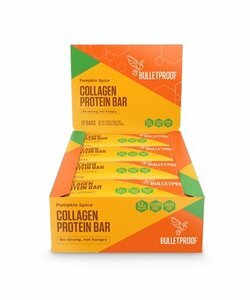 Why Bulletproof Collagen Protein Bars? 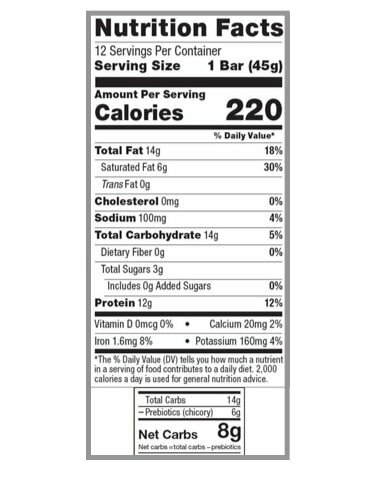 Protein bars can vary greatly in composition and quality. 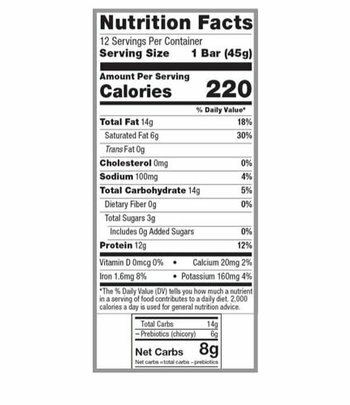 The protein usually comes from whey protein isolate and the bars often contain a lot of sugar. People following a low-carb diet won't be able to use most protein bars for this reason. In addition, not everyone tolerates whey protein, for example, due to sensitivity to milk protein or sugars. 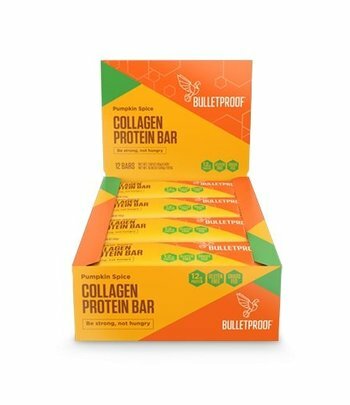 Bulletproof makes protein bars with collagen from grass-fed cattle. This is animal protein but comes from the skin of cows. 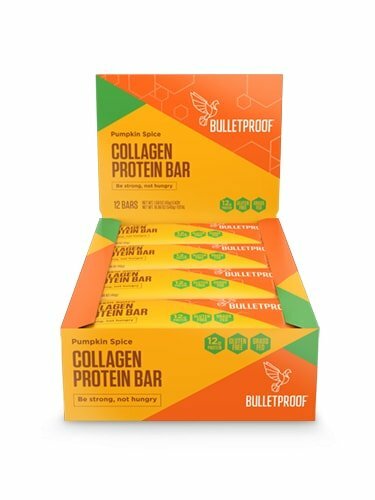 Bulletproof's collagen protein is enzymatically processed, making it easy to digest. Bulletproof protein bars contain high-quality fats as the main source of energy instead of carbohydrates. These fats come from cashew and coconut. Some of these fats are medium chain triglycerides (MCTs) (capric and caprylic acid) derived from refined coconut oil. The combination of protein, fat and a low carbohydrate content makes these bars very satiating. One bar is enough to satisfy your hunger for a while. 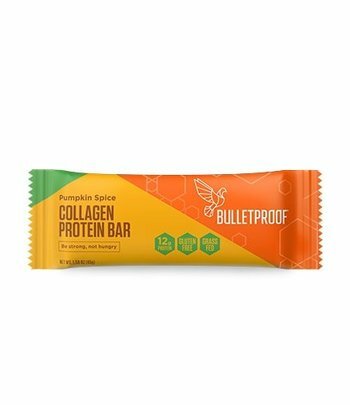 Pumpkin Spice Collagen Protein Bars are packed with protein, and they’re tasty and satisfying, too. With notes of cinnamon, ginger, and nutmeg, get the taste of pumpkin pie without the sugar and gluten. Use: Ideal at any time of day, before or after a workout. Best to eat on an empty stomach. This bar is not very dense. It breaks easy or is already broken when it arrives. It is also a bit greasy because of the XCT Oil. That means you have to consume these bars carefully! Processed in a facility that also processes peanuts, egg, soy, milk, wheat, fish, and crustacean shellfish. RI= EU Reference Intake based on 2000 Kcal.